Skilled presenters understand the importance of Q & A. If they handle it well, they’ll be able to use this time to convey their confidence and expertise, to reinforce some of the ideas they shared, even add in material they may have left out or glossed over. If a speaker stays positive and in control of their content and delivery, they’ll be able to continue to build credibility with those who agree with them, as well as win over the nonbelievers or those on the fence. Q & A can also be a vulnerable time for speakers, as they could get tripped up, challenged, or attacked. Time spent brainstorming questions that could be asked, then preparing and practicing effective responses can help speaking pros minimize those fears. They’ve also mastered the four types of Q & A. This is the typical point questions are entertained, certainly in more formal settings with larger audiences. The problem with ending with Q & A is that the longer it goes, the fewer and farther between the questions become. The back rows have already started to slip out the door and you end with a smattering of applause from the remnant that remains. And remember—there’s always a chance the questions may turn negative. What’s the last thing you want your audience to hear—your final takeaway? Or that audience member’s hostile take-down of you and your ideas? Pros are able to handle questions positively and concisely, sideline the off-topic questions, and navigate the challenging ones with tact and grace. This is my personal favorite. Why? If you insert your Q & A before the conclusion, a couple of nice things happen. The audience tends to regulate themselves because they know they still haven’t heard your conclusion. And you get to have the last word. You finish to thundering applause and everyone knows it’s done-done. So try, “Before I wrap-up, I have time for a few questions.” Take 3-4 of them, then move right into your final remarks and action step. Everyone will walk out of the room with your thrilling conclusion ringing in their ears. 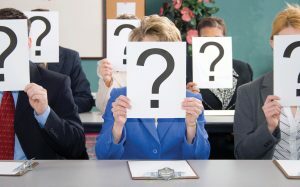 Most internal work presentations are met with frequent interruptions from the audience, as they usually see this, not as a true presentation, but as more of a discussion. The executives in the room certainly do. So the trick here is to manage the incoming questions, remember where you were when they stopped you, then find a way to bridge back to your prepared content. Try not to let your answers last longer than the presentation itself. Be as concise as you can, then ask if that answered their question. Better to do that than to assume everyone suddenly wants an intense deep-dive into everything you know on the topic. Are you a master of all these Q & A situations? Prepare for all four types and you’ll be able to call yourself a Pro!